I celebrated my last Christmas in the Philippines in 2007. Since then, I have been celebrating Christmas abroad here in the UAE. Christmas back home is different. It is more fun in the Philippines as they say. However, having lived in a foreign country for almost 10 years, I have learned how to adapt well and accept things as they are. UAE has been very accommodating to Christians like us in this special occasion, which I am very thankful of. However, Christmas is not a holiday here, it is just an ordinary day. This means we had to work on Christmas day. So we celebrated Christmas without my better half, as he had to work night shift on that day. We just had our usual Noche Buena and gift giving for the kids and attended Christmas day mass the day after. The kids had all sorts of gifts from friends - toys, clothes, etc. I wasn't really expecting anything on Christmas, but I received the best gift so far. 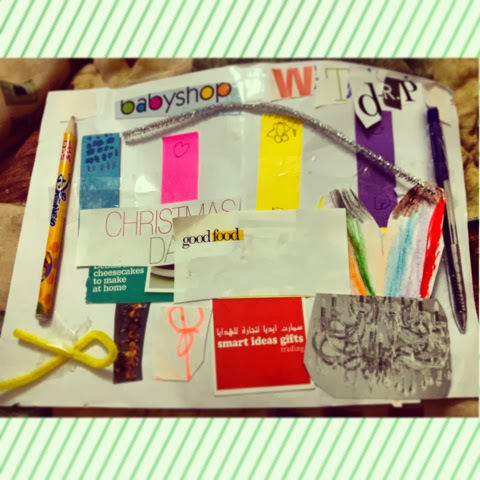 My daughter made this "notebook" from scrap. I think she had the idea from our usual craft activities during the weekends. He just put whatever she thought was cute and helpful and made this special notebook just for me. Obviously, all of us wore green as they say it is the lucky color for the year of the wood horse. We had our usual media noche, but compared to the previous years we didn't make it grand. We only had enough for the whole family and a few friends. As a tradition, I asked my children to jump a couple of times so that they will grow tall and scattered some coins for luck and prosperity throughout the year. We also had the 12 round fruits and 7 dried fruits on the table. And while Dubai was having the grandest NYE celebration ever, Abu Dhabi was - blah! Looking back, 2013 was full of ups and downs, failure and hope. I have lost some and I have gained some. Life is like this. It's always bittersweet. It could never ever be a bed of roses. I know this New Year, I will have a lot of challenges along the way, a lot of changes and new beginnings. I am looking forward to a better New Year, but along with it I am preparing to face the future trials that it may bring and equipping myself with faith, prayers, love and hope.